We get a lot of requests for smaller bodied guitars–and we have a pretty good selection, from basic on up. Here are three models from Eastman, all smaller, with great features. We don’t know why they decided to offer these as limited edition models, but we won’t complain. 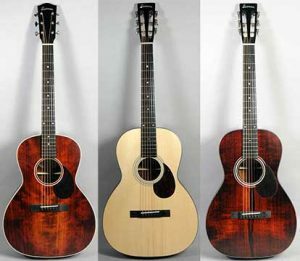 They’re all solid construction, featuring Adirondack spruce tops, and come with Fishman pickup systems. O body. The Eastman 1OO-Ltd. has a OO body with a 12-fret neck. And the Eastman E1P-Ltd. is a parlor model.